cab drollery: To Hell With Them! Well, the Supreme Court of the United States has issued its decision in the Hobby Lobby case and made it clear that our owners' "religious beliefs" trump women's rights and health. I'm not surprised, but that doesn't mean I am not thoroughly disgusted. 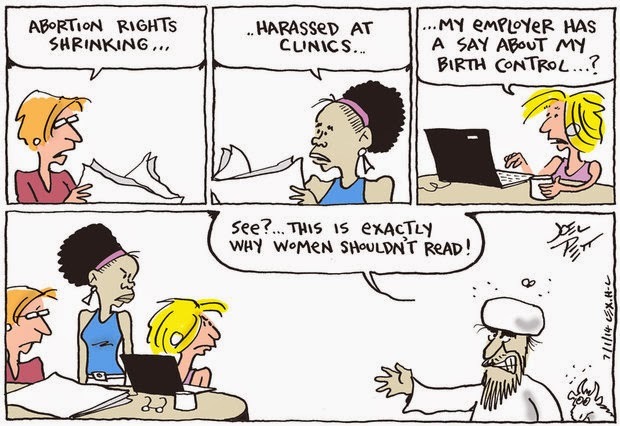 I think that Joel Pett's cartoon captures the issue nicely, if more politely than I would have been. What angers me is that what it boils down to is that the religious beliefs of the majority of justices are being imposed upon the entire nation, which is a slippery slope no matter how you look at it. I'm all for accommodating sincerely held religious beliefs, but a more rational, not to mention more equitable way of handling it is to allow the holders of those beliefs to apply it to themselves. If you don't like abortion, don't get one. If you think blood transfusions are evil, don't have one. And (sigh) if immunizations are against your religion, don't get them. I think, however, that there is more in play than deeply held religious beliefs. Again, Pett's pictorial comment nails it. There's some serious misogyny in play here, and an op-ed piece in the L.A. Times suggests yet another problem with the decision. The specious reasoning in Justice Samuel A. Alito Jr.'s majority opinion could embolden employers to assert a "religious" right to deny other health benefits to their employees — from immunization to blood transfusions to psychotherapy — or to discriminate in other ways. And by stretching the meaning of a law intended to protect individuals, the decision threatens to fracture what has been a bipartisan support for reasonable accommodation of religious beliefs. While the holding is limited to closely held companies, the impact is going to be wide-spread. And those "deeply held" religious beliefs run contrary to other individual's deeply held beliefs. More importantly, it provides for the government to step in, whether by executive fiat, legislative action, or Supreme Court holdings to impose other regulations which favor one religion over another. This is probably causing Thomas Jefferson and other early patriots to spin in their graves. Of course, the fact that Hobby Lobby is going to save all sorts of money in medical benefits didn't enter into the equation at all. Nope. No reason to think the rest of our owners aren't chuckling and waiting to make some more moves. Not a chance. I look at the current make-up of the Supreme Court and wonder if Harry Reid and his caucus are happy they kept their powder dry when those last confirmation hearings were held. Like I said: to hell with all of them. No, Hobby Lobby won't even save money. It turns out to be more expensive for an insurer to pay for a woman's pregnancy and birth, and then to add the newborn to the policy, than just to cover birth control-- the main reason the insurance companies were all for the mandate in the first place.